Thanks to Nvidia, you’ll soon be able to stream tons of games to Facebook Live. 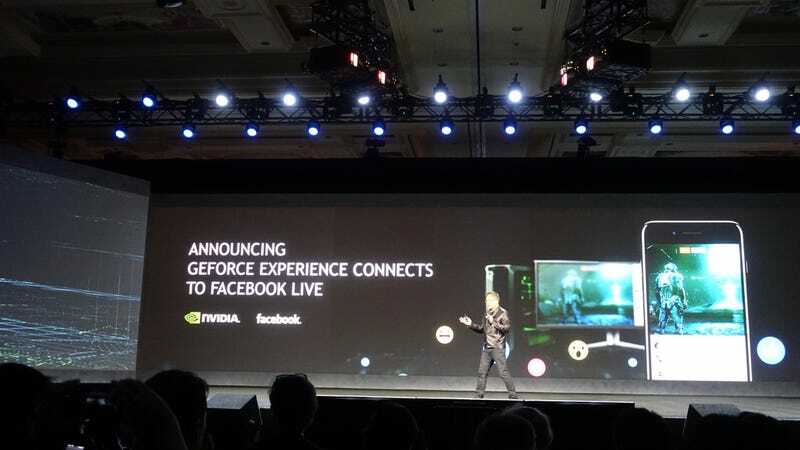 At its big CES press conference, Nvidia made the announcement, which could help make Facebook Live a bona fide platform for esports and friendly game streaming. This isn’t the first time we’ve seen game streaming come to Facebook Live—Blizzard added it as an option to Overwatch back in June—but this is the most robust gaming option to come to the platform yet. The new streaming will utilize the GeForce Experience, Nvidia’s gaming platform that lets GeForce owners download game-specific drivers and optimize their games for their PCs. GeForce Experience already supports live game broadcasting for Twitch and YouTube Live, but supported games (the whole list is here) will soon work with Facebook Live too. To show it off, Nvidia streamed some game footage from BioWare’s upcoming Mass Effect Andromeda—set to hit stores in March—directly to Facebook. This is a big deal for Facebook Live, which has spent the last year trying to make itself the live streaming platform of choice. Gamers predominately stream to the Amazon-owned Twitch or to YouTube Live, but getting buy-in by a gaming leader like Nvidia could make Facebook a genuine contender.